International wants to take on its rivals in a test of fuel economy, aerodynamics and drivability. International Trucks in the US has dared its rivals to put their vehicles against it in a test of fuel economy, aerodynamics and drivability. It wants the challenge to take place during the week of August 31 at parent company Navistar’s testing ground in New Carlisle, Indiana. The challenge is open to each of International Truck’s direct competitors in the Class 8 category (semi-trailers). It says the challenge will give competitors the opportunity to provide their two best-peforming trucks when it comes to fuel economy and drivability. "The heavy-duty products we are building today are the highest quality, most fuel-efficient trucks we have built in decades," senior vice president of truck sales and marketing Jeff Sass says. "We have worked hard to ensure our heavy-duty products lead the way in fuel economy, driver appeal and uptime performance, and we want to prove it." 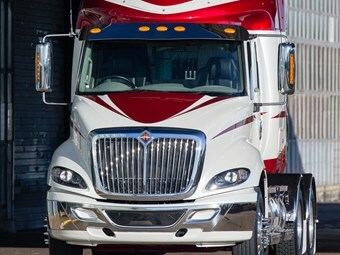 International has issued a set of challenge conditions, namely that the vehicle must be Class 8, have an on-highway sleeper cab, be a 2016 model with a 2015 calendar-year build, and be fitted only with factory-installed options. The trucks must also meet current compliance measures, be capable of delivery to all customers, and fall within a total mileage range of 2,500 to 15,000 miles (4,023-24,140km) to maintain consistent break-in levels. International says testing will occur on a closed track on trucks with a gross combination weight of about 65,000 pounds (2.9 tonnes) and fitted with standardised trailers and tyres from Navistar. International adds that additional areas being tested will include ride vibration and harshness, curb-to-curb cornering ability, forward visibility and interior noise.